CHANDIGARH: Punjab Pradesh Congress Committee president Capt Amarinder Singh today asked Delhi Chief Minister Arvind Kejriwal as why was he being selective in reaching out to the families of the farmers committing suicide. “For heaven’s sake stop celebrating tragedies”, he told the Delhi CM, while referring to the Aam Aadmi Party’s announcement that it will adopt the children of the farmer who committed suicide in Barnala over his inability to repay the debt. Capt Amarinder pointed out that there were hundreds and hundreds of farmers who had committed suicide and their families also needed relief and rehabilitation. “While providing relief to the Barnala farmer’s family is a nice gesture, will you also spell out as what you plan to do for other families whose earning heads also committed suicide?”he asked Kejriwal. The PCC president told the AAP and its leader that instead of resorting to theatrics and photo-ops, he should better come out with a plan for providing relief to the farmers. “Agriculture is too serious and sensitive an issue for someone like you to understand”, he told Delhi CM, while pointing towards his lack of knowledge and experience about agricultural matters, or for that matter, the matters of governance as a whole. Capt Amarinder said, the agriculture problem in Punjab is too serious to be solved by photo ops and theatrics. “You need a comprehensive policy and planning”, he said, while adding, “we have already mooted a law to prevent dispossession of debt ridden farmers’ land or property as a first step”. He said, had such a law been in place the Barnala farmer, whose family Mr Kejriwal is planning to visit, would not have been forced to commit suicide. 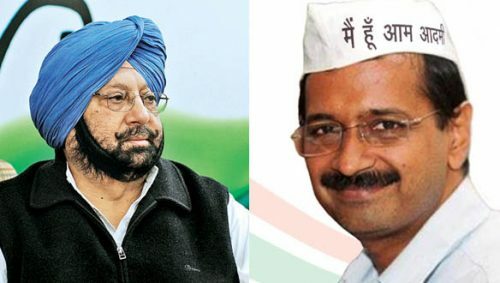 “From past experience we know you are fond of selling and celebrating tragedies to get a photo op as you did after the attack on Pathankot airbase and you are doing it now”, Capt Amarinder told Mr Kejriwal, adding, “this is not the time to sell somebody’s tragedy and make political capital out of it, but seriously think and come out with plans and measures that can prevent further suicides and loss of precious lives”. He pointed out, while Mr Kejriwal visited the two martyrs in Punjab, he completely forgot others, including one from his own state.